Picture the scene: It’s launch day, and after keeping a close eye on ‘Game X’ for months — years, even — the wait is finally over. If you chose to pre-order, ‘Game X’ likely popped through your letterbox in time for breakfast, otherwise you’d typically pay a visit to your local store in order to pick up a copy, hot off the shelf. Tearing the cellophane off your shiny new timesink — providing you favored physical over digital, of course — is an innocent thrill that all players can relate to on some level. But there’s another, near-universal feeling that many of us have felt on launch days gone by, and that’s frustration. Let’s get one thing straight right off the bat; launch day should be cause for celebration on both ends of the industry’s production line. For the developer, it’s that oh-so-sweet moment of crossing the finish line and shipping a product to market that embodies years of hard graft, while the consumer, having spent the entire dev cycle looking on from afar, finally has the opportunity to lay hands on the finished product. But that’s just it; the term “finished product” doesn’t necessarily carry the same weight in the modern-day video game industry, does it? Between day-one updates and the steady stream of patches, you’d struggle to pinpoint a game released in 2017 that hasn’t been subject to some form of tinkering after hitting the market. Stamping out bugs and various technical issues is all well and good, but when ‘Game X’ offers a markedly better experience two, three, or even six months down the line, it does raise the question: why bother buying a game on day one to begin with? On paper, the answer is simple. By securing a copy at the outset, you’re investing in the developer or their pixelated vision (or both!) in order to play ‘Game X’ as soon as possible and, knowingly or unknowingly, participate in the general launch buzz — to be a part of the conversation, as you excitedly exchange stories, tactics and tales of valor with co-workers and friends. Either that, or, like me, you have little-to-no self-control when it comes to buying games at launch, even as your backlog continues to balloon in the shadows. You know how it is. 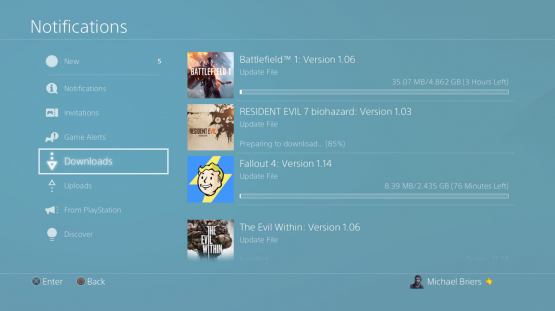 Updates and updates and…I really need a faster Internet connection. Over the years, early adopters have been conditioned to expect minor teething problems on day one, particularly if ‘Game X’ happens to be open-world in nature, or, in the vein of For Honor, if it requires a consistent online connection to play. And that’s when issues start to arise. 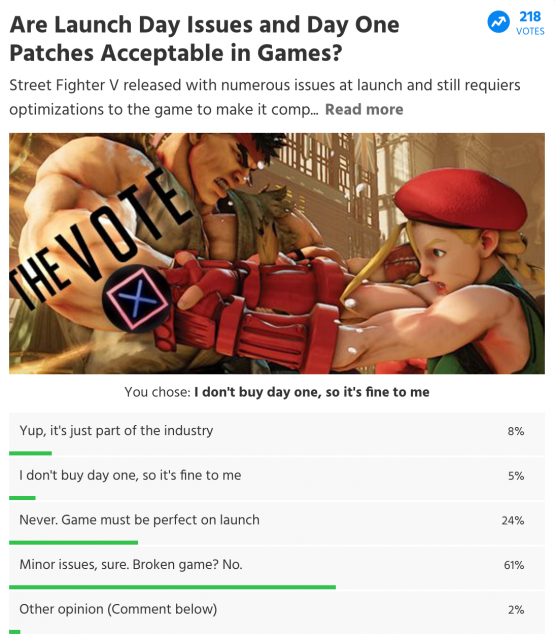 Street Fighter V isn’t the only culprit, of course. Other games that have been rendered borderline unplayable at launch include DriveClub, Batman: Arkham Knight (on PC, mostly) and even Halo: The Master Chief Collection, which limped out of the gate in 2014 and wasn’t fully functional until Halo 5: Guardians rolled around the following year. Ditto for Battlefield 4, which was in such a sorry state during its opening month on the market that EA branded the entire launch “unacceptable.” To their credit, the publisher turned things around in time for Battlefield 1, but that feeling of being burned by a broken game is a difficult one to forget. Plus, the prevailing logic that games don’t necessarily have to function perfectly out of the box is a dangerous one. Fine-tuning the experience and twisting the knobs ever so slightly after launch is expected — inevitable, even — but not at the expense of a smooth, consistent experience across all platforms. You’re probably familiar with the concept ‘known shippable’. For the uninitiated, it’s a software development term used to describe a technical problem(s) not deemed serious enough to postpone a product’s launch, and is therefore quietly earmarked for a future patch. On the developer’s end, it’s the equivalent of them holding their hands up during QA and admitting that, yes, that bug(s) exists, and yes, we’re prepared to ship ‘Game X’ with said bug because it’s either so rare the chances of triggering it are practically zero, or it’s labelled an innocuous technical glitch that doesn’t spoil the user experience. The latter often occurs in open-world games, and in recent years we’ve seen the likes of Fallout 4 and The Witcher 3: Wild Hunt fall prey to a smattering of technical mishaps at launch. That being said, it’s fair to say that open-world games tend to get a free pass when it comes to glitches — to an extent — then there’s also the matter of excusing high-ranking developers (see: Bethesda, CD Projekt Red) if ‘Game X’ endures a rocky start on the market. It’s not strictly speaking apples to apples, but do you really think Fallout 4 was subject to the same level of criticism as, say, Assassin’s Creed Unity? Communication is often key in a situation like this, and corrective action usually comes in the form of an accelerated patch. Perhaps that’s the reason why CD Projekt Red is often held in such high regard. A combination of a pragmatic DLC plan and a relatively open dialogue with the end consumer worked in The Witcher 3‘s favor. As is so often the case, it’s best to judge things on a case-by-case basis. Common logic dictates that buying Resident Evil 7 on day one, a back-to-basics franchise revival that’s designed solely to be a single-player experience, presents a much smaller risk than, say, For Honor, and in Tyler’s review, matchmaking woes proved to one of the latter’s major flaws — something that will no doubt be remedied in the not-so-distant future. I’ll continue to buy games at launch; I just won’t rush out to buy certain games. In a perfect world, these kinds of teething problems would remain exclusive to the realm of Early Access. More than anything else, it’s disheartening. It’s disheartening to shell out $60 on day one, only to feel burned by a game that is clearly a ways away from the finished product. Aside from maybe Nintendo — a company renown as a hallmark of quality — it’s difficult to guarantee that ‘Game X’ will be firing on all cylinders from the get-go. The counterpoint here is that developers are no longer beholden to a strict cut-off date, and now have the capacity to tidy up any lingering issues and even iterate on their vision long after release. Just look at the changes coming to Final Fantasy XV‘s Chapter 13, or the all-new scene shoehorned into Watch Dogs 2 that teases a potential trip across the pond. If this really is to be the new norm, then at the very least, developers must communicate their vision to the audience long in advance so early adopters don’t feel cheated or, worse, like glorified beta testers. I honestly think it’s great that studios are able to roll out free improvements, so long as it’s within reason. It may seem petty to moan and groan about developers going that extra mile to perfect their vision, and it’s certainly a more complex issue than it appears, but if that extra graft was done prior to D-day — even if it results in a slightly delay — then it would relive a lot of headaches on both ends of the production line. The views expressed in this article are those of the author and don’t necessarily represent PSLS as a whole.